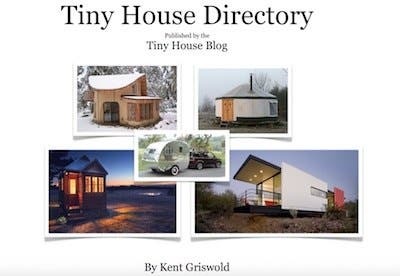 I have been following the tiny house movement since first reading about Jay Shafer over 10 years ago. Of course, I loved the idea of saving on money and time and, thus, having more freedom. 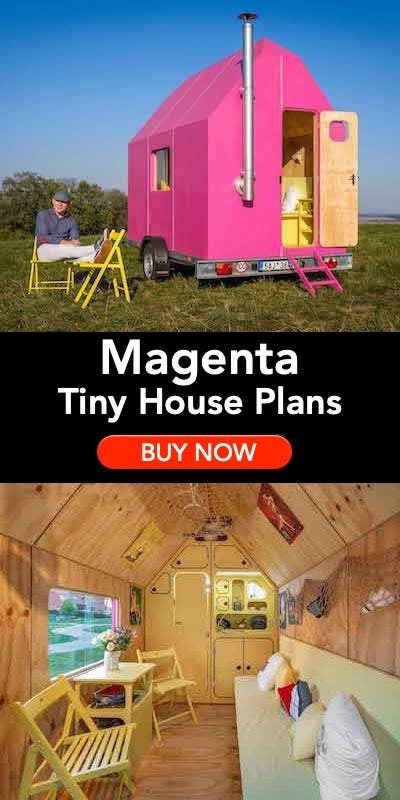 In addition, I wanted to combine the benefits of a tiny house with the health benefits of building out of non-toxic materials. Also, I felt it was important that it be beautiful and acceptable in (almost) any neighborhood. I decided to build an 8 X 12 design, but without porch or loft and with more windows and light. This mobile house-room is meant to be an extra space or living area but without utilities except electricity. In other words, toilet, kitchen, and shower are meant to be in a nearby building. The trailer is a customized aluminum trailer by Featherlite–thanks to Scott Boyner for engineering exactly what I wanted. 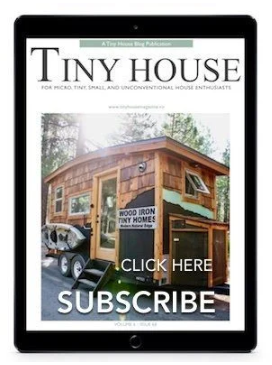 The frame is aluminum–won’t magnetize or corrode–but the bed of the trailer was constructed using Timbersil–wood that is infused with sodium silicate (glass) and won’t burn, rot, mold, or be eaten by insects. The underside of the trailer also was covered over with a layer of Tyvek with chicken wire over that. 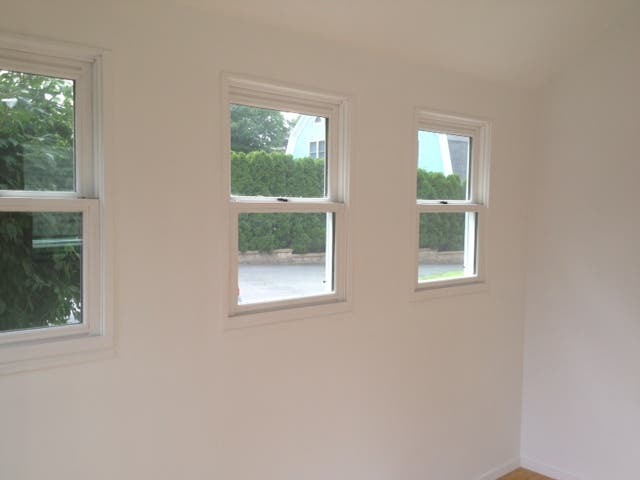 Conventional wood frame is all treated with three coats of potassium silicate by Romabio. All interior and exterior floors and walls are made of Magnesium Oxide panels–also won’t burn, rot, mold and gives off no harmful gasses (but do wear protection when cutting, there is fiberglass mesh inside). These were purchased from Holdfast Technologies in Ohio. 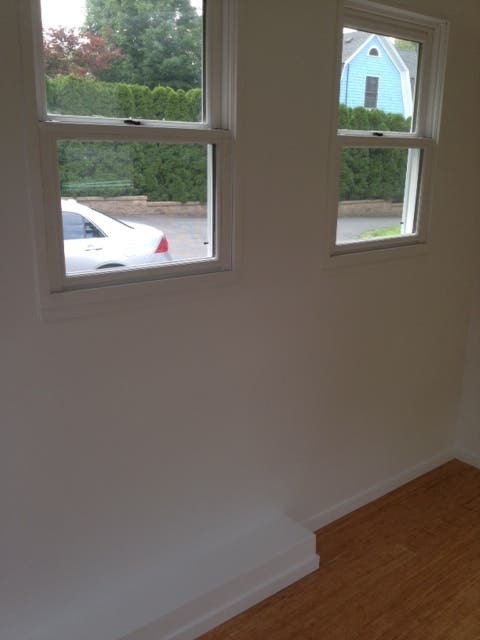 All exterior trim that could not be sized in Magnesium Oxide is Hardieboard, another cement board. 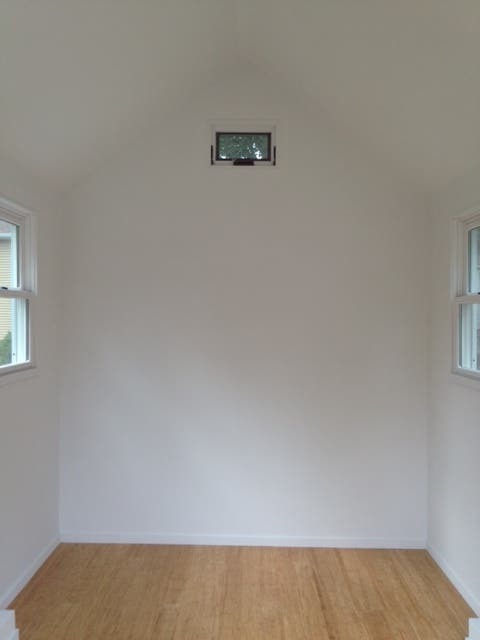 All walls, ceiling, and floor are insulated with Ultra Touch recycled cotton insulation. 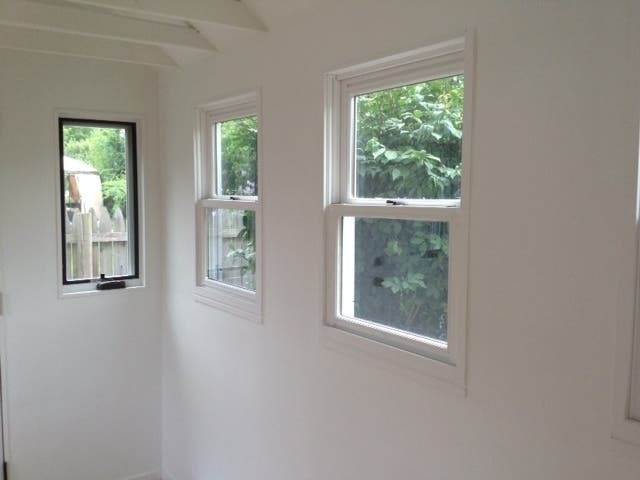 All interior and exterior paint is supplied by Romabio (romabio.com)–truly non-toxic mineral paint that allows water vapor to escape and, thus, avoids conditions for mold. (It turns out that many popular no-VOC paints still contain harmful irritants). The roof is covered with two layers of Vaproshield–a polypropylene membrane that is also vapor permeable. Over that we used Davinci synethetic roof slates–they are made of recycled plastic and really do look like real slates. Windows are Jeld-wen, unfinished pine with aluminum cladding. 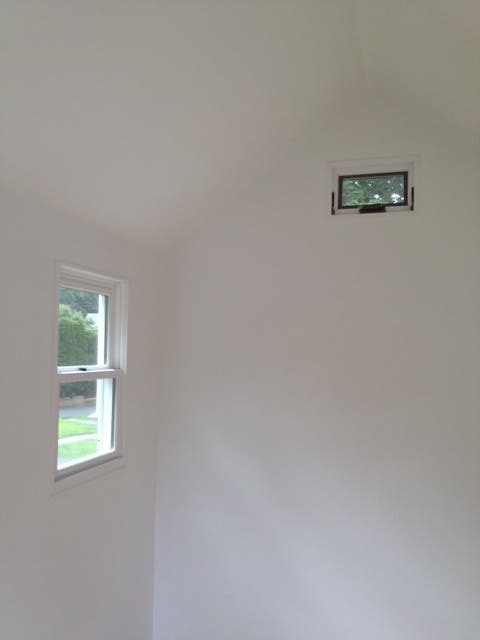 We painted the interior pine with the same paint we used on the walls. Electricity enters at only one point and there are four sockets on the interior side there. This is intended to minimize EMF issues. 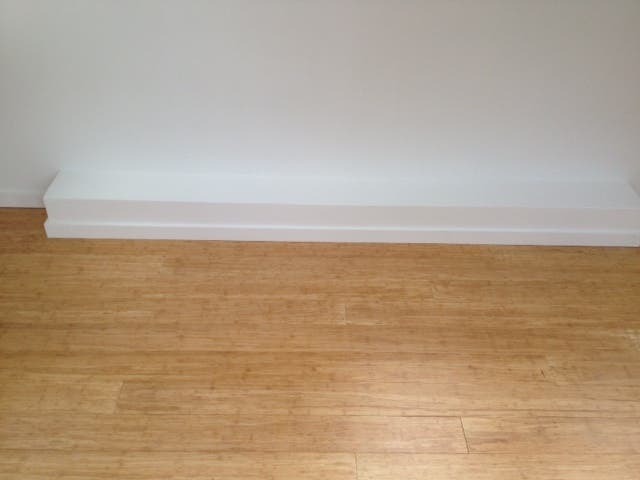 The finished floor is Ecotimber bamboo. Been looking for this idea in place, for an out of the house office room…. Debra, I had not planned to sell it, but I would be happy to discuss it. Please send your contact info to Kent at THB to forward to me and we can explore further. As I was planning my TH, I was wondering about using bamboo instead of pine wood. Can you tell me where you got the Ecobamboo and what the cost is per foot? I looked in to bamboo for environmental reasons and found out that it uses tons of energy and chemicals to make the flooring that is comparable to wood so I decided against it. From what I read it was just better using wood, in the end it uses less power and produces less waste to make in the long run. Also, with a bamboo floor you’re ‘dirtying’ third world countries which I find unfair. Stan, I don’t know that all those points apply to the Ecotimber brand; but it is true that it was shipped from China. I wondered about bamboo. I want to use maple (good dance floor) & cherry trim, local grown & milled. My sister in law had bamboo installed and it dented and scaped as badly as pine just from everyday use. If you really want a beautiful, relatively inexpensive, recycled floor, look at an end grain floor made from old beams. Lisa, I am glad you found this post helpful. I cannot recall the price for the Ecotimber, but I know I thought it was reasonable. I purchased it from the centerforgreenbuilding.com. All of this eco stuff at what kind of pricing/cost? It is nice you can get something to fit your requirements and intended use. Where did you get the roof slates? How well do they hold up when traveling? Resist hail? Joyce, I approximate the total for all materials and labor, including the more costly aluminum trailer, to be around 33,000. The slates from davinciroofscapes.com have held up beautifully thus far in all weather, including one trip on the highway. 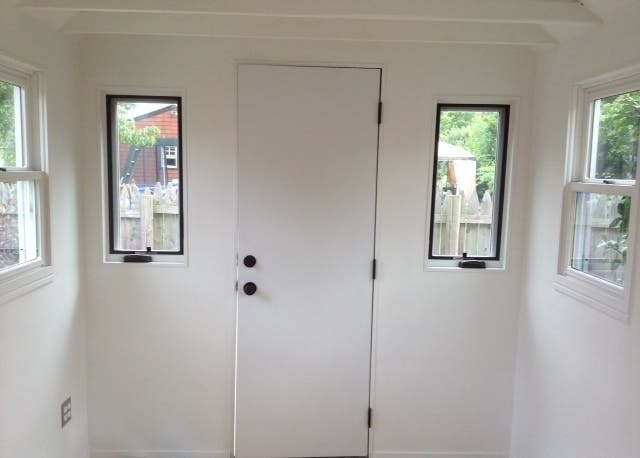 You may notice that they are spaced tightly to make the look proportional to the size of the house–with the added benefit of making them more secure. How do I advertise on the Tiny House Blog and what are the rates? What was your final cost for it? 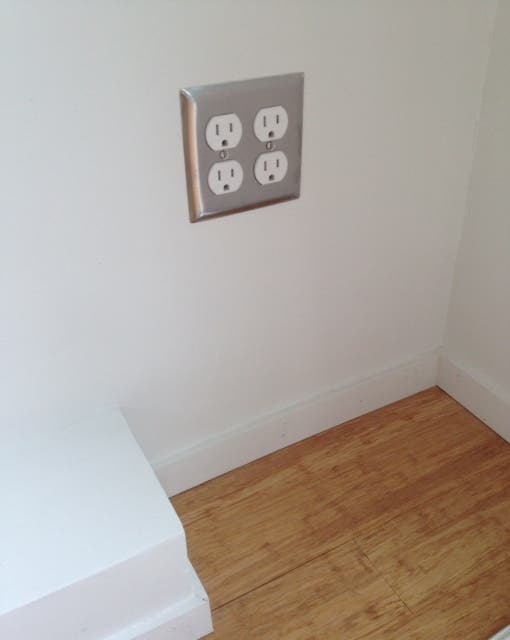 Looks great- the only thing that would bother me are the one-point of electricity, which will probably result in extension cords being wrapped around everywhere for lighting, computer, hot plate, etc. I know you had a reason for it but I don’t understand exactly what that means. I just know from having rooms in older homes with electrical outlets on only one wall- it is pretty inconvenient in real life. Wow thats quite the exercise in avoidance. I do a similar thing except my method is to simply avoid materials that have a barcode. I like the Board&Batten look, and the colors. It’s beautiful! Love all of the eco-friendly materials you used. Love to see a follow up through the winter months on the efficiency of the insulation you used. Thanks so much! REALLY appreciate all the great information about non-toxic materials! 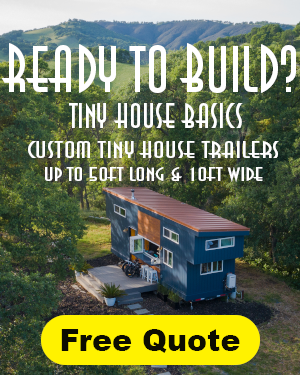 My MCS is one of the big reasons I’m looking at tiny houses…aside from the fact that they’re a great idea in the first place, and who wouldn’t want to live well for way less? Thanks again for all you do. I wish there was a better way to design around wheel wells. 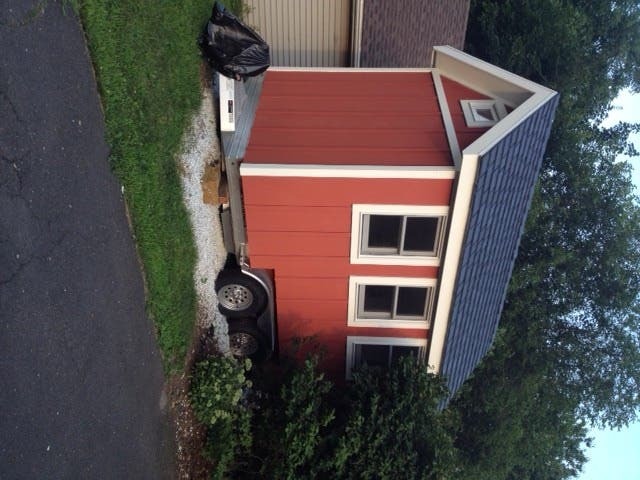 One idea is to extend axle outside the house, which adds base stability. But then, this effectively narrows the house. Another idea is to build-in a bench seat around each well. Other ideas? 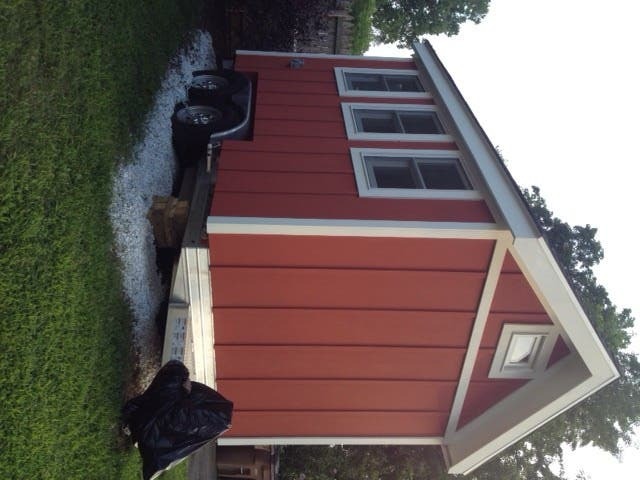 We thought we would raise the whole floor above the wheel wells and and dormer out the roof in that area of our tiny house. The raised area is the kitchen and bath. We plan on putting in a cedar sleeve under the raised kitchen and foaming around the sleeve and sliding a frame that holds a queen size mattress under the kitchen. The area is foamed to prevent any critters, crumbs etc. from getting in the bed area. I believe that this will be a great place for guests. What is the intended use for your tiny? Jan, the current use is as an extra space but with the option to use in the future as a living space or as part of a group of small spaces. When I began the project, I did not know that I would find myself living with someone else! How do you dispose of materials that don’t “burn, rot, mold”? ET, that is a totally valid question. My understanding is that the majority of the product is Magnesium Oxide, the most abundant mineral on earth. As such, it may be able to return to the earth. However, it does also contain a fiberglass mesh inside, clearly a human-made waste product. Like the home, needsxsome color and a little more power, EMF be damned! 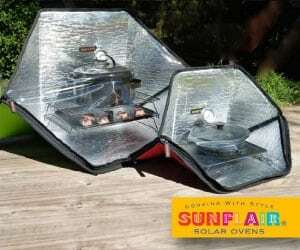 Seriously, if that’s your worry use solar 12 volt system. Also love bamboo and for your purpose it works, but for those being green, its not at all. Yes it’s sustainable, but its not green due to the high carbon footprint left behind. It is harvested, shipped to port by truck, to the US on a huge fuel guzzeling ship (read: Gallons per mile not miles per gallon), to the end user by truck again. Much more green to choose locally sourced hardwoods in your area. 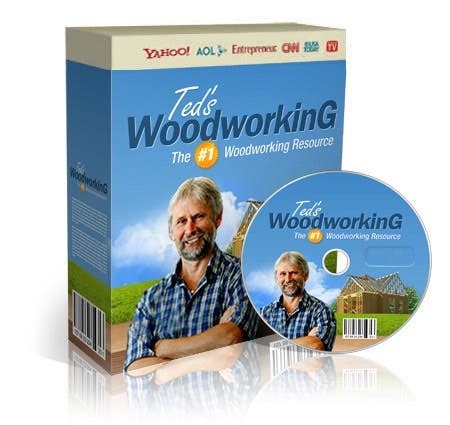 Very green with todsysxfotedtry methods and keeps your money in your back yard! This is cool, I wanted to do something like this to save money, i.e. leave out the loft, kitchen, and bathroom, to save money and then add it in later when I had the money. 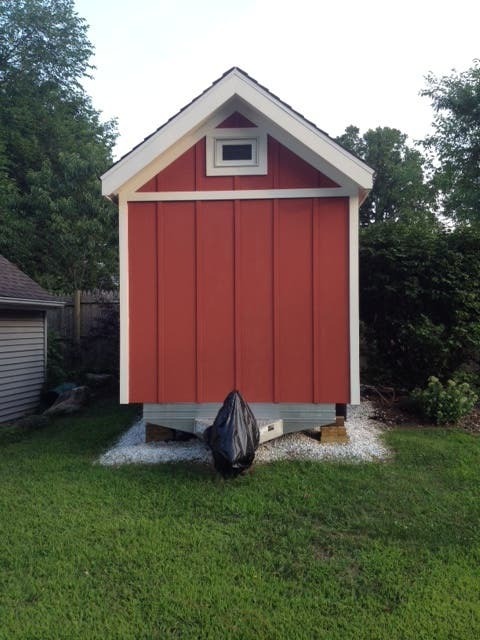 I was renting a room from friends and they would let me park a tiny house in their backyard for free so all I needed immediately was a room and still use their bathroom. I’m still looking into it. If pictures are taken of how this space is used I’d love to see them! I am very impressed by the designs and would love to own one…what a cool concept! how very sweet of you to raise my awareness of posting twice. I guess that being rude is an acquired habit. one habit that I won’t partake in. Make no mistake, Aluminum DOES corrode. It doesn’t ‘rust’ like steel does. But it does corrode if exposed to weather. Ask anyone who works on aircraft airframes or aluminum boats. Corrosion Control is a big part of the job. I love all the comments, the responses from you Ty, and as an environmentalist, all the attempts at being green and the added info input that everyone has done. It seems to me the best way to be truly green is to get as much materials that can be reused safely, locally. Windows, doors, lumber, flooring, cabinets, etc etc. Less off gassing, less to the landfill, less travel as long as we keep it local. Not always easy to find, but worth trying!! keep up the communication, we all need it as we embark on this fairly new journey.